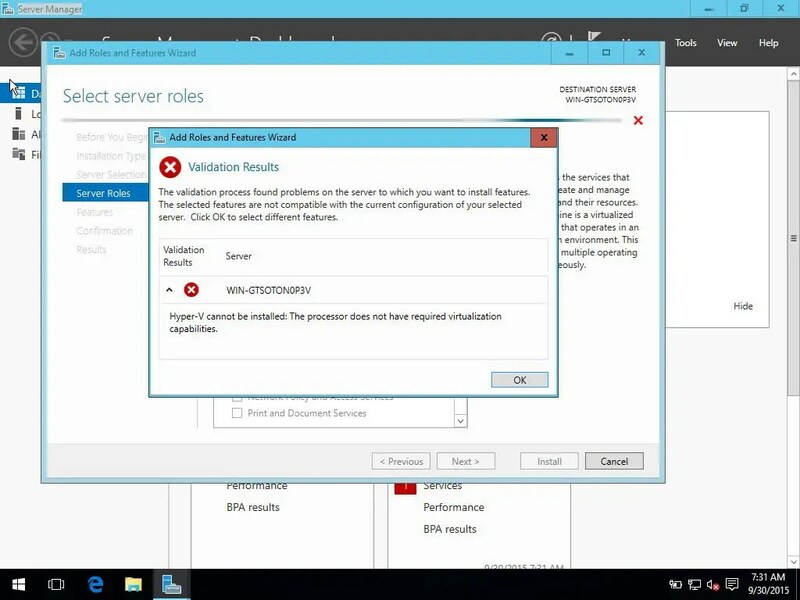 “Hyper-V cannot be installed: The processor does not have the required virtualization capabilities.”, but does it really not? Installing Hyper-v in Virtualbox is of course not recommended. You are going to use a virtualization tool and then use another layer of virtualization. For test purposes or just because you can, is it of course possible. I assume in the blog post below that you already have a virtual machine running Windows OS in VirtualBox. If that is not the case, you can first follow this post. The problem here is that you want to use virtualization within a host that also uses virtualization, so the virtualization is already occupied by VirtualBox. This makes it impossible to use Hyper-v in Virtualbox. Fortunately, I have found a solution for this. The manual consists of two parts. The first part is for the system administrators among us with access to PowerShell. The second part is for end-users who want Hyper-v within VirtualBox. Which is also with PowerShell but explained better including screenshots. Hyper-v in VirtualBox the basics. Before we can start we must first verify that virtualization is enabled in VirtualBox. Double click the Virtual machine. Go to the tab system. verify if VT-x/AMD-V is enabled. It may be that this already solves your problem. So you could now check whether you can install Hyper-v in VirtualBox. You can also finish the rest of the tutorial. Start the Virtual Machine and make a remote desktop connection to the Virtual Machine. 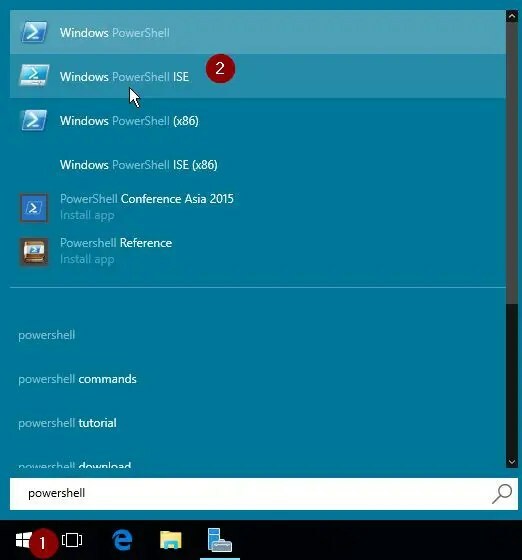 Go to start and search for PowerShell. The brief and to the point part. Copy / paste the following commands in PowerShell. It is best to use it per line. The longer but clearer explanation for dummies. First, do not restart the VM while you are doing this. 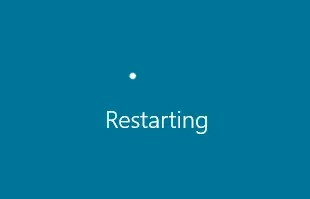 Do not restart the VM until the end. Copy / paste the command into PowerShell and wait for the script to finish. Again, Copy / paste the command into PowerShell and wait for the script to finish. And again, Copy / paste the command into PowerShell and wait for the script to finish. ..and again, Copy / paste the command into PowerShell and wait for the script to finish. At last, Copy / paste the command into PowerShell and wait for virtual machine to re-start. If you now look in Server Manager at Server Roles, you can see that the Hyper-V role is installed on the Virtual Machine. The post originally dated from May 28, 2015. I have reviewed the post and thought that it could be worked out better, which is why the post has been re-published on 27-6-2018. The content is still relevant. It installs just fine but will not power on a Hyper-V guest VM. 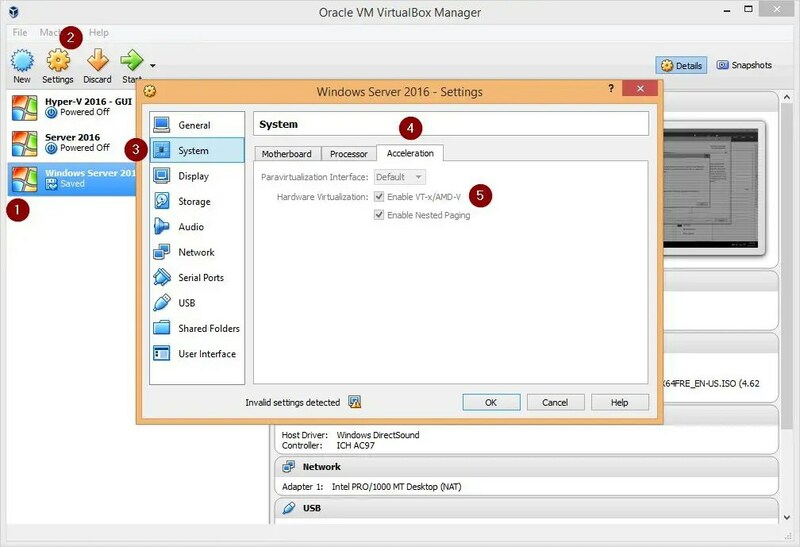 Virtual Machine “New-VM” could not be started because the hypervisor is not running. Hardware virtualization is enabled on the Settings/System/Acceleration. Next is to see if the guests will boot from the Hyper V Manager. thank you for these steps. i have installed the Hyper-v feature . but will test it out and let you know. This enables Hyper-V on your machine (Hyper-v is necessary to process ‘virtual machines’ on your computer). This is needed to keep the VM state when shutting down your PC. Simple and powerful solution! When Windows GUI prompted it can’t, when many technical articles mentioned it can’t, you mentioned it CAN. It’s just installed. Thanks a lot! Thank you very much bro. You are a legend. What is actually the need of the RSAT features? The first cmdlet ( Enable-WindowsOptionalFeature –Online -FeatureName Microsoft-Hyper-V –All) already installs all Hyper V on the local machine (tested in Win10 Pro x64). The RSAT cmdlet target remote machine and per default not included in Win10/2016, as explained here. Only the “Multiple-IO” sounds useful to me. Goal: use my dev env (Visual Studio 2015) in a VM in VirtualBox, and use there Hyper V for the mobile emulator. I downloaded the RSAT package, but the cmdlet cannot be run on Windows 10 Pro. It seems to be only for Windows Server. Anyway, the first cmdlet only already install all packages on Win10 Pro. The Virtual Machine Management Service failed to start because one of the Hyper-V components is not running. So it seems I need a Windows Server to run the full cmdlets and install the required packages. I thought that someone had finally cracked the nested VM in virtualbox – but not so. Hyper-V installs but there are issues with some components that prohibit the installation of a VM into that next layer. 15350 The virtualization infrastructure driver (VID) is not running. And as a consequence 15340 The virtual machine bus is not running. I you have way of fixing this that would be much appreciated. Did you ever get this working? I’m having the same problem. I have the same problem. I can install Hyper-V but most of the services will not start and consequently, VMs will not boot. For anyone still having problems with this: When trying to use nested VM in VMWARE Workstation you need to add the following lines in the vmx file, open it using text editior and add the following lines. 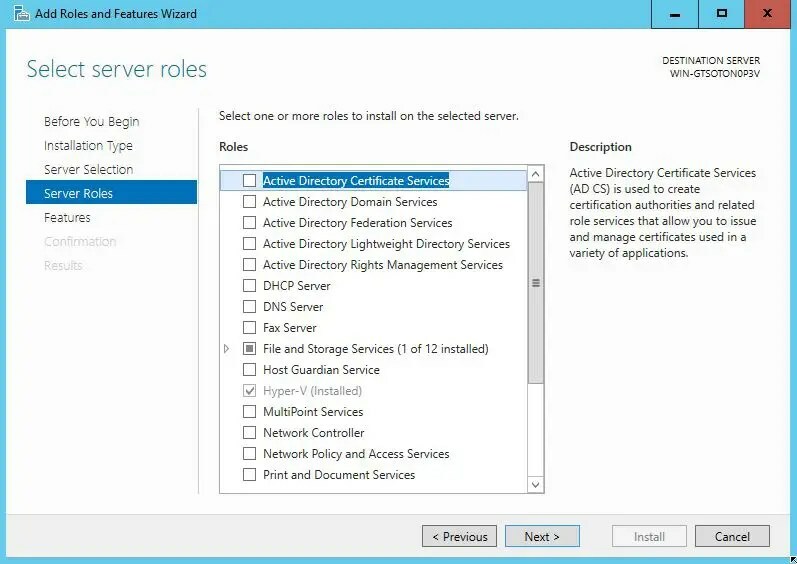 This will allow you to run nested VM within Windows Server 2012 inside VMWARE. After doing this Hypervisor should now run your virtual machines. … but you can’t start Virtual-Machines with these Setup… right ? I tried to replace it with Get… and Add…, but no. Enable-WindowsOptionalFeature : Feature name RSAT-Hyper-V-Tools is unknown. What OS are you using in your VM? [04:30:25.015][Updater ][Info ] Local version is up to date. [04:30:25.015][Updater ][Info ] Check for update done. [04:30:28.984][Dhcp ][Error ] Unable to start the dhcp server: The requested address is not valid in its context. Will retry. [04:30:29.499][Dhcp ][Error ] Unable to start the dhcp server: The requested address is not valid in its context. Will retry. [04:30:30.015][Dhcp ][Error ] Unable to start the dhcp server: The requested address is not valid in its context. Will retry. [04:30:30.531][Dhcp ][Error ] Unable to start the dhcp server: The requested address is not valid in its context. Will retry. [04:30:31.046][Dhcp ][Error ] Unable to start the dhcp server: The requested address is not valid in its context. Will retry. [04:30:31.562][Dhcp ][Error ] Unable to start the dhcp server: The requested address is not valid in its context. Will retry. [04:30:32.077][Dhcp ][Error ] Unable to start the dhcp server: The requested address is not valid in its context. Will retry. [04:30:33.109][Dhcp ][Error ] Unable to start the dhcp server: The requested address is not valid in its context. Will retry.